That the General Synod Council be instructed to immediately develop a plan for the orderly dissolution of the Reformed Church in America, for presentation to the classes for a vote no later than 1 March 2017, and that the activities of all boards, commissions, committees, units, and agencies, save for those required to fulfill contractual responsibilities or to provide support to the ministers, missionaries, and staff be suspended until such a vote is taken. 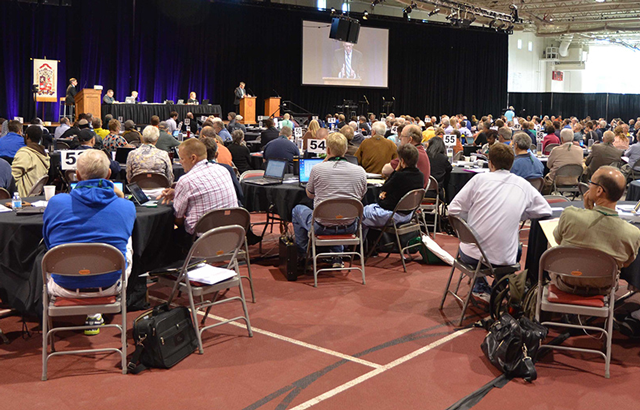 This was the last motion I wrote for the 2016 General Synod of the Reformed Church in America. I wrote it Tuesday morning, in the final hours of the Synod, thinking that it would be an appropriate response to our debate about the report from the Special Council on Human Sexuality. I say that because we basically, as a Synod, showed the church and the world that we refused to have a common understanding of Scripture, worship, or polity; what is left for us to do together? To declare that the General Synod of 2016, trusting in the sovereignty of God and the power of the Holy Spirit to work in and through all assemblies of the RCA, affirms the authority of every classis over the formation and care of all churches and ministers within its bounds, and the local authority of every consistory over the worship and life of the congregation entrusted by God to its care. Let’s be clear: this is a declaration without any teeth, without any power, declaring things we are supposed to believe are true anyway. The sovereignty of God and the power of the Holy Spirit to work through assemblies are pretty core Reformed doctrine. But there is the rub: a large portion of the Synod declared that we do not believe in something that should be at the core of our being, even when declaring it would not change anything they wished to do. I confess that, when I was younger, I put motions and overtures on the floor at General Synod worded to try to get some of our leaders to say out loud, “But we don’t want to be Reformed!” because I suspected some of them didn’t. On Monday night, the Synod finally said it without realizing it—to be fair, they had been hinting at it most of the day, while claiming to believe in the inerrancy of Scripture, in direct contradiction to the Belgic Confession—and it was, at least for me, heartbreaking. Make no mistake: I don’t consider my gifts to the church to be all that much. There are many people in the RCA who can do anything I can to many times better than I can do them. There are people who give more to the mission and ministry of the denomination, if for no other reason than they have more to give. But I have given my all to ministry in this daft little church, because I still believe in a church that holds to an infallible but not inerrant Word, that struggles with and grows out of the Word, that trusts the Spirit to speak through its assemblies and trusts those assemblies to be faithful to the best of their ability, and that welcomes in everyone led to understand God and church that way while learning from other branches of the church that comprehend God in other ways. The General Synod of 2016 declared that we don’t want to be that kind of a church. When that happened, it took the last thing I had left—I couldn’t sing anymore. I was supposed to lead the Synod in singing during the necrology prayer at closing worship. The hymn, written for the Synod of 2015, talked of us “walking together,” something which we were no longer doing, nor did it feel as if we intended to do so, and no two-minute prayer for unity could change that. I simply couldn’t bring myself to do that. Many of my friends and colleagues are now strategizing over what to do next, how to win back the RCA. Maybe I will come to feel better; the Spirit has this insidious way of healing us, bringing us back around, and tossing us into the fray again. I’m not so sure about this, however. This can be done, and there are still congregations and classes that are very Reformed, and I know I belong to a classis, and most people belong to a congregation, and not the RCA. The more progressive side of the church has done this before and can do so again. But isn’t that a problem in itself? The activities of certain participants were deceitful, bullying, and anything but Christian. As I understand it, the whole “love one another” thing means that process is at least as important as end result. If, in order to win back the RCA, we all behave in ways that Christ would condemn, how is that any better than trying to grow the denomination by selling out its core beliefs? If we behave in this way, how can any of us call ourselves Christian? Elijah may have gone back and slaughtered all the prophets of Baal, but God didn’t tell him to do it. Jesus, on the other hand, did not go back to the Sanhedrin after the Resurrection and shove down their throats the fact that he was right and they were wrong; he and the Church moved on. No, I am not equating myself with Christ. But I think we need to be thinking about how Christ would want us to live. I am also not prepared to cause schism; I worked very hard to avoid just that on the floor of this Synod. But I wonder if we are prepared to walk together as classes and office-bearers. If it is only me, then, perhaps, I need to step aside. Perhaps there are wiser folk in the Church who can convince me that we are ready to walk together again, and that the various classes actually wish to do so. Perhaps the wiser folk can convince me I didn’t see what I saw at the Synod. I wrote my final motion for the 2016 General Synod, but I didn’t bring it to the floor, because I didn’t have the heart for it. That was either a wise move or a sign of weakness. Until I sort that out, it might be the final motion that I write for any synod. May God have mercy on me. I can understand the difference of opinion…but what truly breaks my heart is the lack of a distinctively Reformed hermeneutic in refereeing the floor mechanics of synod…the lack of a Reformed he r meme uric even among clergy…but the worst for me was the damnable arrogance of those who -in 7th grade fashion – asserted a ‘my way or the highway’ mentality. I will not sink to that way of thinking, believing or being. This is Christ’s Church…I am Christ’s child…mission beckons us all! A few years ago in our yard and pond, we had a trio of male mallard ducks who always hung out together. In fact they tended to walk closer to each other than the male-female pairs. Maybe that was because the others discriminated against them. Can any Christian argue that God did not have a hand in creating this trio? I choose this true story to illustrate that LGBT people are the way they are by birth and not by choice. That being the case, why should anybody deny them the rights, pleasures, and problems of marriage? By the way, I attended G.S in 1965 at Hope College. There was some discussion as to whether young people should be allowed to dance in the churches; the divide being mostly between the East and West branches. Another thing I remembered that at the dining table, many of the representatives from the mid-west would speak Dutch, probably so that us out-landers could not understand what they were saying. But I noticed that after one man had spoke several sentences, they all laughed, so I assumed that the man had told a joke. But the way the others laughed made me suspect that the joke was a little off color, because such jokes produce a different form of laughter than good clean jokes.